At the Grand Canyon there is the Skywalk. It is a horseshoe shaped steel and glass structure that juts out over the Grand Canyon (4000 ft.) and makes you feel like you are stepping onto thin air. To get on the bridge, they take all the items out of your pockets, you have to wear little booties, and you aren't allowed to bring your phone or camera. Instead, there are people whose job is to take pictures, you hand in the ticket they give you and you get a great memory. Erin and I are not the easily scared type of people, in fact, we were told we could jump on the glass and we did, much to the dismay of several people nearby. Someday somebody remind me to share how I was the photo-op for a bus of Chinese tourists. It's a good story. Thanks to Erin Morey for the meme! 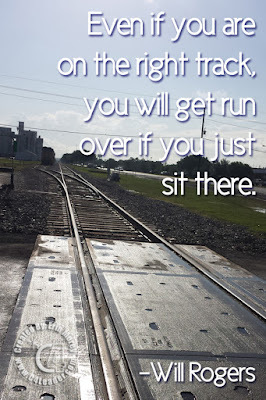 First and foremost, are you on the right track? Are you doing what you want to be doing, or are you doing things that support what you want to be doing? People often find themselves doing things because it is expected of them, or they think "this is a temporary situation, someday..." The problem is that temporary can become permanent when you aren't paying attention and someday quickly becomes never in those situations. So, are you on the right track? Well, for want of $400 she let the patent slip and now companies are making millions while she receives nothing, is struggling with house payments and doesn't have a reliable car. She was on the right track but has been run over. Now, I am not going to make judgments, because I cannot know her situation. All I can say is that in 2005 if she spent $400 would we be seeing this tool everywhere still today? And would she be making money from it, rather than watching it on TV and wondering? The world is full of these situations. So, what track are you on? And are you standing still or making progress?